In 1879 the Kelly Gang came up with the idea of creating armour from mouldboards. They used hammers to beat the metal into shape until it could be worn as a suit. 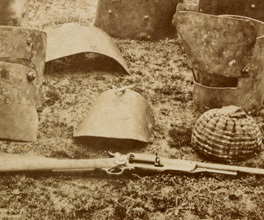 When Ned Kelly was captured and his gang members killed, the gang's armour quickly became a source of fascination and conflict between the police involved in the final shoot-out. Superintendent Hare, who led the attack at Glenrowan, felt entitled to a souvenir as a reward for the major role he played in the gang's capture. He took a set of armour that he thought was Ned's, but which actually belonged to Joe Byrne. ...the Beechworth Museum...are anxious to have one suit of armour presented to them. Now I entirely disapprove of this as its exhibition will keep up the disgusting Kelly-heroism and have a very detrimental effect on the rising generation. My intention is apply to the Chief Secretary to have the four suits smashed up at once. Oldis, K 2000, 'The true story of the Kelly armour', La Trobe Journal No. 66, Spring. The State Library of Victoria worked with the Victorian Police Museum and personal collectors to collect all pieces of Ned Kelly's original armour. It is now displayed at the State Library of Victoria's permanent exhibiton, The changing face of Victoria. Sadleir stalled. He knew that Standish was due to retire, so he delayed sending the suits until the new Commissioner sent for them. He therefore provided the remaining sets of armour to a head office that no longer wanted to destroy them. It was not until years later that historians were able to clearly identify the various parts that made up Ned Kelly's suit. Dramatic events surrounding the Kelly Gang's capture added intrigue to their fascinating story.